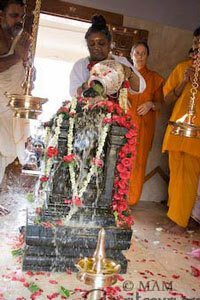 Brahmasthanam Temple is a unique concept of worship born out of Amma’s Divine intuition, where the devotee is encouraged to physically participate in pujas aimed at removing malefic influences of planets in one’s life. A Brahmasthanam Temple is distinguished by an unique “Pratistha” with images of Lord Siva, Devi, Ganapati, Serpent (representing Muruga and Rahu) sculpted on the four sides of a single granite stone. 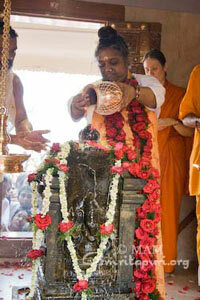 This is symbolic, the concept of unity, that Brahman is the basis behind all forms of divine manifestations. 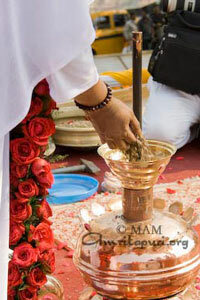 At Brahmasthanam Temples, devotees themselves perform “Graha Dosha Nivarana Pujas.” This worship mitigates adverse influences of malefic planets on living beings on earth, and restores peace, harmony and prosperity. These Brahmasthanam temples, which emphasize on self participatory pujas are open to one and all, regardless of religion, caste and race. A Brahmasthanam Temple is a perennial source of spiritual ambrosia which helps, guides and fulfills the thirst of material and spiritual seekers of the present as well as for all ages to come.